The autumn raptor migration was in full flow along with what seemed to be an increased presence of monarch butterflies. With recent rains and cooler nights, water temperature and salinity in the Hudson Highlands were slowly dropping from summer highs, but some brackish water fishes were still around. 9/16 - Bedford, HRM 35: In the first hour at the Chestnut Ridge Hawkwatch we saw broad-winged hawks rise from the trees and form kettles to the south and east. The next few hours were extremely busy with many healthy kettles passing through. Approximately 1,400 broad-wings were counted in one hour at midday. The total for the day reached 3,361. Non-raptor observations included seven ruby-throated hummingbirds and 48 monarch butterflies. 9/13 - Catskill to Bear Mountain, HRM 113-46: Across a 67 mile reach of the river from Catskill to Bear Mountain, the Riverkeeper Patrol has been seeing large rafts of duckweed (Lemna sp.). It is fluorescent green, beautiful, and being released from the marshes as water chestnut and other vegetation break loose at the end of the season. Once exposed to tidal current, off the duckweed goes. 9/13 - Town of Wappinger, HRM 67: With careful observation it is not difficult to discern that the half-dozen ruby-throated hummingbirds stopping by our feeders now are in migration. The four local birds that spent the summer here (pair and offspring) likely left more than a week ago and are sampling someone else’s feeders to the south. The present birds are a bit more wary, a lot more skittish, and frequently will not settle but rather drink from a hover. 9/13 - Bedford, HRM 35: It was a fairly slow day compared to yesterday at the Chestnut Ridge Hawkwatch. We had mostly sharp-shinned hawks (16) with only two broad-winged hawks. The most excitement we had was when an immature red-shouldered hawk was spotted in midday as it flew into the trees with something in its talons. Non-raptor observations included two ruby-throated hummingbirds. 9/14 - Selkirk, HRM 135: I noticed that the only visitor to the hummingbird feeder this evening was a lone female. The family and groups of hummingbirds appear to have moved on. While watching the hummer, I counted eighteen wild turkeys in the backyard. I’ve seen this group on several occasions this past month and this time their presence was also noticed by my guinea hens. 9/14 - Rhinebeck, HRM 90: A strong and sustained northwest wind signaled the wake of a passing cold front. The midday wind-against-tide produced a raucous river with whitecaps climbing to nearly three feet. An osprey, a northern harrier, and two bald eagles – one immature, one adult – were using the tailwind boost to zoom past, presumably migrating. 9/14 - Dutchess County, HRM 82: The leucistic red-tailed hawk we have dubbed “Lucy,” that has been around the Stanfordville-Clinton Corners area for more than three years, was sighted this evening by Carol Pedersen as we left my barn. Lucy was a distant speck in the sky, seemingly flying with a black vulture until we lost sight of her heading north over Jameson Hill. 9/14 - Croton Point, RM 35: We searched Croton Point looking for the osprey family of five from the cell tower nest near the Croton train station. The parents and three young were spotted last week in a tree overlooking Eagle Bay on the north side of the Point. The first dead tree we came to held one osprey on a high branch, while another flew nearby. Farther along a third bird was perched on another dead tree. It was nice to see them again since we had monitored their progress in the nest this spring and summer. 9/14 - Bedford, HRM 35: Despite strong winds out of the northwest today at the Chestnut Ridge Hawkwatch, migration was slow. Thirteen sharp-shinned hawks were the high count. Non-raptor observations included six ruby-throated hummingbirds. 9/14 - Bronx, HRM 14: Within seven minutes of each other, I saw two sharp-shinned hawks winging their way along the eastern bank of the Hudson just north of Spuyten Duyvil, where the Harlem River meets the Hudson. Each was carrying a small bird in its talons. Shortly thereafter, I watched as seven more sharp-shins circled and soared on thermals above the river. 9/14 - Inwood Hill Park, HRM 13.5: Columbia University created a little marsh adjacent to the park with areas of salt marsh, freshwater marsh, and damp meadow. Spartina [salt meadow cordgrass] was thriving along with grasses that grow in drier places. Goldenrods and New England aster were blooming. Elsewhere along the water, flowers of yam-leaved clematis were suddenly profuse. There, as well as up in the woods, common dayflower was having an abundant second flowering; the flowers were small and low down, but very beautiful. On the path up The Clove jewelweed was now in full flower but not as abundant as in recent years. The woods generally seem tired, as if this summer’s combination of heat and lack of rainfall hadn’t been ideal. The asters that bloomed up there seemed almost finished, while white snakeroot, which usually blooms at the same time, was just budding, and goldenrods were noticeably absent. 9/15 - Bedford, HRM 35: There was a nice flow of broad-winged hawks (226) throughout the day at the Chestnut Ridge Hawkwatch. Most were seen very high directly above the watch. Other highlights include an adult bald eagle that flew right over the platform. Non-raptor observations included seven ruby-throated hummingbirds, two common ravens, and five monarch butterflies. 9/16 - Saratoga County, HRM 164.5: This was Day 54 for the wayward harbor seal above tidewater, and there have been no sightings in nearly two weeks. I think the seal probably just moved its home base (it has been Lock One of the Hudson-Champlain Canal) as it seemed to be doing alright for itself. I have visions of the seal being “MIA” for a while, and then suddenly appearing this autumn. This is a plucky little animal. 9/16 - Haverstraw Bay, HRM 36: We were sailing along on our 22 footer, going about seven to eight knots, with little wave action, on a starboard tack. We timed our glance perfectly to see an eighteen-inch fish breach the water and “fly” along parallel to the gunnel only six inches away. Even in the short time we saw it, the fish was unmistakable: It was a small sturgeon. If we had been on the port tack it would have landed in the boat. The knot meter on our sailboat read 3.9 km/hr. which must have been the speed at which it cleared the water. 9/17 - Hyde Park, HRM 82: About twenty minutes after sunset, I counted four small bats (little brown myotis) flitting about, up and down our wooded road. This is fewer than in previous years when I've counted up to seven at a time, but it's more than this year's average of one to two, and likely the most I've seen at one time this summer. They all seemed to be catching insects quite successfully. 9/17 - Poughkeepsie, HRM 75: We were in our yard in mid-morning when we heard and saw a pair of hawks calling. At first we thought they were red-tails, the most common hawk in our neighborhood. However, the calls didn't seem right; instead we saw the diagnostic characteristic features of red-shouldered hawks - probably a pair in migration. 9/17 - Kowawese, HRM 59: Dawn was rising over the Hudson Highlands as we set our seine in the shallows. The river had cooled off to 75 degrees Fahrenheit and gotten a bit less salty at 4.0 parts per thousand [ppt]. 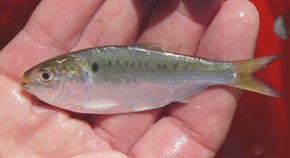 Bluefish and silversides were missing but in their place was another brackish-water marker: young-of-the-year [YOY] Atlantic menhaden or “penny bunker” 71-81 millimeters [mm] long. We caught two different year-classes of smallmouth bass (75-175 mm), probable emigres from Moodna Creek, a quarter-mile down river, and too many YOY blueback herring (60-68 mm) to count (hundreds). 9/17 - Garrison, HRM 51: As our tour boat approached Mystery Point in Garrison, a magnificent adult bald eagle appeared seemingly out of nowhere and plucked a fish from the Hudson. The eagle was gone in a flash, white tail gleaming in the sunlight, as it retreated to the wooded shoreline to enjoy its catch. 9/17 - Croton-on-Hudson, HRM 35: Hummingbirds continued to flock to the feeder and this morning I had a special treat. 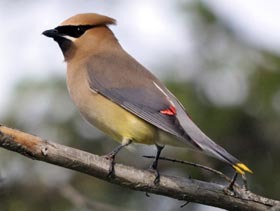 As I watered my garden, one flew up to me and hovered around my head for close to a minute, close enough that I could feel the breeze from its wings on my face and shoulders. A beautiful feeling. 9/17 - Bedford, HRM 35: It was a surprisingly quiet day at the Chestnut Ridge Hawkwatch considering yesterday’s activity. Very few broad-winged hawks (23) were around but we had a surge of sharp-shinned hawks (42) in the last two hours. 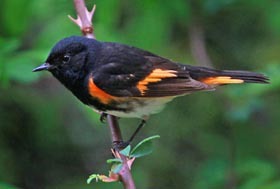 Non-raptor observations included ten ruby-throated hummingbirds, twenty-two monarch butterflies, and two common ravens. 9/17 - Croton River, HRM 34: I began my day being buzzed by hummingbirds on my deck and finished the day with a kayak paddle at dusk on the Croton River under a setting crescent moon. Fish were rising all over and the “fish eaters” were on notice. A classic tale retold: An osprey dove and caught a fish; as it rose there was a flash of white in the trees - the tail of a bald eagle; it chased, harassed and caught the fish released by the osprey in mid-air. As the adult eagle flew upriver, a juvenile flew out of the trees and followed. I later encountered the juvenile in the shadows on a gravel bank devouring a fish. As I returned down river, I saw the two eagles twice more as they scouted the river from trees and shore. Also joining in the moving buffet were many great blue herons, cormorants, and kingfishers. 9/18 - Minerva, HRM 284: Our leaves were only vaguely colored here in Essex County. A little frost would be a good thing. Blue asters and boneset were blooming nicely, and winterberry hollies were loaded with red berries. 9/18 - Bedford, HRM 35: Broad-winged hawks were moving today at the Chestnut Ridge Hawkwatch, but a south wind kept them away from us. Broad-winged totals for the season had reached 3,724. Highlights of the day were an adult and an immature bald eagle in midday. Non-raptor observations included three ruby-throated hummingbirds and six monarch butterflies. To subscribe to the Almanac (or to unsubscribe), go to DEC's Email Lists page at https://public.govdelivery.com/accounts/NYSDEC/subscriber/new , enter your email address, and click on "Submit." Fill in and submit the requested information on the “New Subscriber” page. This will take you to “Quick Subscriptions”. Scroll down; under the heading "Natural Areas and Wildlife" is the section "Lakes and Rivers" with a listing for the Hudson River Almanac. Click on the check box to subscribe. While there, you may wish to subscribe to RiverNet, which covers projects, events and actions related to the Hudson and its watershed, or to other DEC newsletters and information feeds.